When related species come into contact they might character displace and coexist, they might converge and coexist, or they might exclude each other completely from their ranges. Much theoretical work has described how each of these outcomes could be predicted to occur. Yet, little work has examined when you might expect convergence versus divergence, and empirical evidence is lacking of examples comparing when related species might on some occasions coexist and others exclude each other. 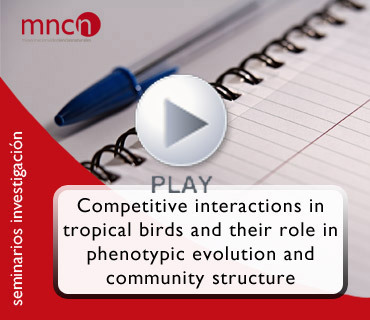 Here, it´s showed how two related species of tinkerbird coexist in Central and East Africa, facilitated by character displacement in their song and morphology, while in West Africa there is competitive and/or reproductive exclusion. Also, it`s described the interaction between two further tinkerbird species that are largely excluded from one another’s ranges and relate those patterns to the molecular phylogeny. Showed an example of character convergence and discuss how it also facilitates coexistence in Amazonian antbirds. Presentación: Borja Milá, investigador Ramón y Cajal del Departamento de Biodiversidad y Biología Evolutiva del Museo Nacional de Ciencias Naturales, CSIC. Ponente: Alexander Kirschel, Oxford University & University of Cyprus.